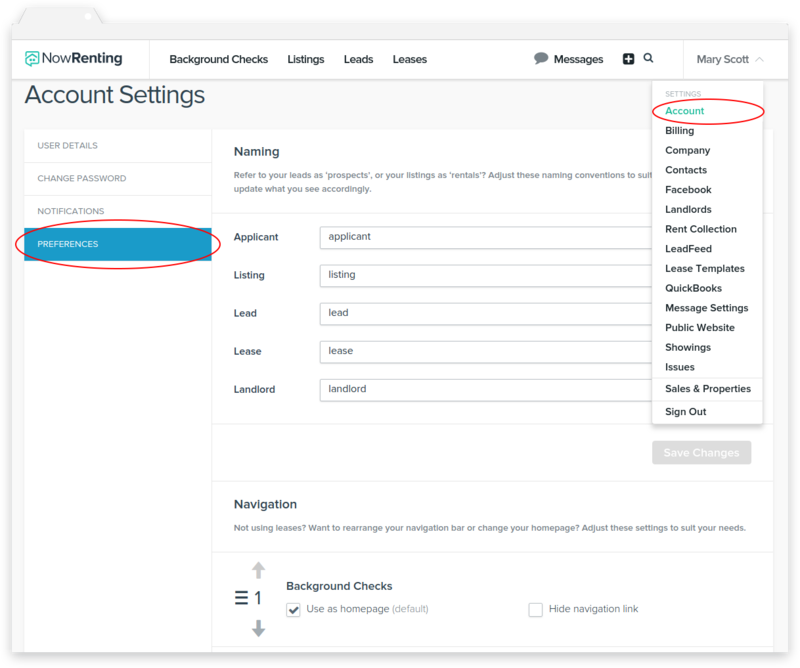 To change the displayed names of NowRenting features: Under Naming, each NowRenting role (Applicant, Listing, Lead, Lease and Landlord) has a text input box. Anywhere that the website would display the name of that role, we’ll replace it with what you enter into the box. For instance: If your business refers to potential tenants as ‘prospects’, you can enter ‘prospect’ instead of ‘lead’. Then NowRenting will call potential tenants ‘prospects’. To change the navigation bar tab order: Under Navigation, each section has a number, and they’ll be displayed in the top navigation bar in that order. You can change the order by clicking the up or down arrows, and then the Save Changes button. To change which navigation bar tabs are displayed: The checkbox labeled Hide Navigation Link will cause that link not to be displayed in the top navigation bar. To change your NowRenting homepage: The checkbox labeled Use as Homepage controls which page is your default landing page in NowRenting.